A very long time ago a yellow dog appeared in a Toba village in the north of Argentina. No one knew where it came from, it was suddenly just there. It had a pretty face and, strangely, a little beard as some monkeys do. That made it interesting. Nevertheless, nobody wanted it because it was very dirty and covered with scaly sores. When it approached people they shouted at it to go away and threw things at it. Then the dog would put its tail between its legs and look back sorrowfully. One man, Dabu, took pity on it though. He called it to him and gave it something to eat. He let it stay in his house with his family. He even covered it with his poncho because it was cold and the poor dog was shivering. One night when everyone was sleeping the little dog began to change its shape. It grew and grew until it was a tall as a human being. Its dog’s hind legs became a man’s legs, his dog’s front legs became a man’s arms, and its tail disappeared. Finally its head and face became those of a tall handsome man. It turned out that he was a God in disguise, the God of the Tobas, who had come to earth to find out if people were good. He woke up the man, Dabu, who had helped him. "Rise up quickly, my son," he said. "You have much to do and not much time to do it in. Tomorrow the whole earth will burn because the people are evil. There will be a great fire which will leave nothing alive. Only you will be saved because you are good; you and your family." "What must I do?" Dabu asked. "Listen carefully," the God told him. "Dig a large hole, deep enough so you and all your family can to fit in. When you have finished, climb in immediately and cover it with a tree trunk. Inside the hole you will be protected." Dabu listened, his black eyes shining. He had no doubt that this beautiful man speaking to him was the God of the Tobas. "Once the fire has spent itself you may leave the hole," the God said. "But hear me well: do not hurry or be over-anxious, for whoever does not have patience and leaves the hole too soon will be changed into an animal." When the God left, Dabu grabbed a shovel and began digging a very deep hole, for his family was large. There were parents, sons and daughters, grandmothers and grandfathers, aunts and uncles, nephews and cousins, daughters-in-law and sons-in law. When he finished digging many hours later, he called all his family together and ordered them to get into the hole. When his son asked why, he said it was the God's will--so they all obeyed. Then Dabu rolled a huge tree trunk over the hole, leaving just enough space for him to enter. Dawn came and they heard a crash of thunder and saw, even in the hole, the light from a ray of lightning. Then the earth began to burn: trees, grass, houses, everything. Time passed and the fire gradually went out. Inside the hole they no longer heard the sound of flames crackling nor smelled smoke. Then one of Dabu's nephews said: "The fire is out. I'm going to see what it's like up there." "Wait!" the others said, for Dabu had told them that they must not hurry. But the young man wouldn't listen and he climbed out of the hole. Outside everything had burned. Only the earth itself remained, a mass of charred rubble and ashes. But since that young man had been in such a hurry to leave, he took only two steps and CHUP! he turned into an ant-eater. The next day one of Dabu's daughters said she was bored, that there was nothing to do in the hole and she couldn't stand it any longer. Dabu pleaded with her not to go out yet, but she left anyway. Immediately she was transformed into a crocodile. Another day passed and impatience grew among the people still in the hole. 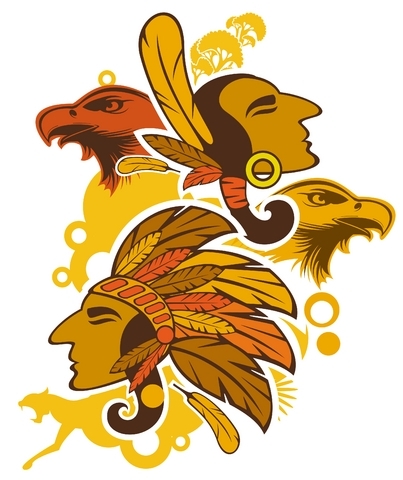 A man left and was turned into a boar, another man left and became a yacaré; then a woman turned into a bird and a man a ñandú. The others who left became different animals: herons, pumas, storks, foxes, even snakes. Finally, those few who had been patient left the hole. They remained human beings. A little bird began to cry because there was no grass and it couldn't find insects to eat and everything was so barren and ugly. It cried and cried as it scratched at the earth with its claws until finally it found a green root. The God came to it and said: "Plant that root and new things will grow." The little bird planted the root and immediately grasses sprang up, then trees, which grew very quickly. And the earth was soon green again. The men and women who remained people had children, then grandchildren, great-grandchildren and then great-great-grandchildren. The Toba nation was born from them. The animals formed from the people who had left the hole too soon were the first animals that inhabited the earth after the great fire. The first ant-eater was the father of all the ant-eaters which came afterwards; the first crocodile became the mother of all the crocodiles; and the same thing happened with all the animals. The Tobas say that the parents of the animals still live and they do their best to protect their children. They become very angry if someone harms them without the proper respect. They allow men to hunt for food as long as they do not harm even one animal more than they need. If the men hunt down more animals than they really need, of if they waste what they have hunted, the animal Parents, who are very powerful, become enraged and take revenge on the culprit. They may cause the hunter to fall ill or get lost in the forest - and they never allow him to hunt again. The other animals, the domestic ones such as cows and sheep and goats, came afterwards. God sent them from heaven. That is how the earth came to be as it is today, with trees, grass, plants, animals and people.